They say that shoes make the man, so investing in a well-made pair of leather shoes is a wise decision for any gent. If you take proper care of them, a good quality pair of shoes can look and feel marvellous for years to come. All you need is a little time and the right tools. The Charles Tyrwhitt Shoe Care Kit contains everything you need to tackle common cleaning problems. We also sell individual shoe care products, and we’ll talk you through how to use each of these below. Start by cleaning the shoe with a soft clean cloth or a brush to remove any excess dirt or dust. This is so that when you start polishing, you won’t accidentally rub any bits of dirt into the leather. 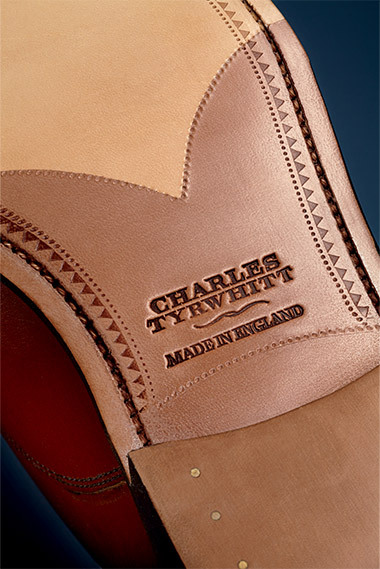 Charles Tyrwhitt leather cream is neutral, so it’s safe to use on any shade of leather. The special formula cleans, conditions and restores all at once, and it’s suitable for waxy leather, smooth leather, patent and reptile shoes. Apply a few dabs of cream to the shoe and work it in evenly using a soft cloth in a circular motion. Once you’ve applied cream to all the leather, wipe away any excess product and leave the shoes to dry for 20 minutes. Finally, we polish. Apply your wax polish in small amounts with a brush and work it into the leather using a circular motion and mild pressure. This may sound obvious but make sure you use the right colour polish for your shoes. 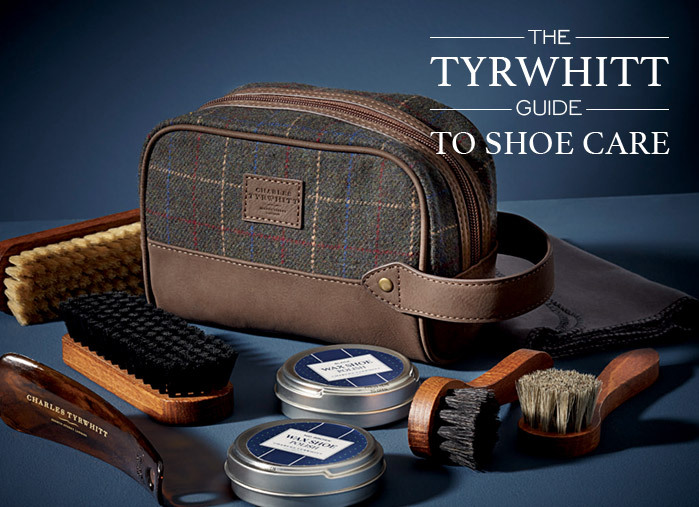 (Our Shoe Care Kit has two kinds of polish, so it’s perfect for keeping all your Tyrwhitt shoes looking fantastic.) Once you’ve finished polishing, wipe away any excess polish with a soft cloth and then buff the shoes using a soft bristled brush. Use a dark brush for black shoes and a lighter brush for brown shoes to avoid discolouration – our twin brush set has two different brushes so you’ll never get them mixed up. Use your brush to buff the leather until it shines and then the job is done. 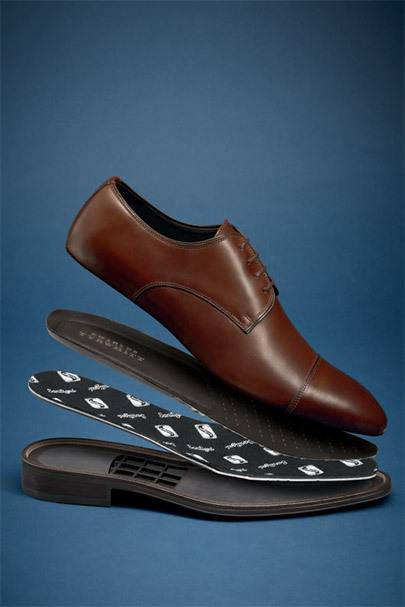 Your shoes should now look impeccable. You can do your best to avoid the rain, but every gent has been caught out in a shower at least once. The most important thing to remember is you should never dry leather or suede by a fire or heater. This can cause the leather to dry out and crack, and there’s no way of repairing your shoes if that happens. Wet shoes should be allowed to dry slowly and naturally in a well-ventilated area at room temperature. If your shoes are particularly wet, you can stuff them with newspaper to soak up the moisture. Lay the shoes on their sides to dry out, as this will allow the soles to dry as well. All our Goodyear Welted shoes feature a strip of leather (known as the “welt”) sewn around the shoe to secure the upper to the insole. This makes the shoe very durable and more resistant to moisture. And because the welt is outside the shoe, it means the sole can be replaced once it is worn through, therefore extending the life of the shoe. Distressed leather or suede looks better with wear, and the crease marks and scuffs add character to the shoe, so you won’t need to polish these as much as a smooth leather shoe. If a shine is required, use a natural polish applied with a duster. Give the inside of your shoes a light spritz with our shoe deodorant to eliminate any unpleasant odours. Always test a new product on a small section before you apply it all over the shoe, in case it affects the colour. Use a shoe horn to put on your shoes, as it will allow you to slip your foot into the shoe without stretching the shoe or damaging the back.